Here in Detroit, there is debate and concern over the possibility that the city’s bankruptcy might obligate it to sell off masterpieces in the local art museum. Is solving a temporary financial problem really worth the cultural impoverishment of the city? 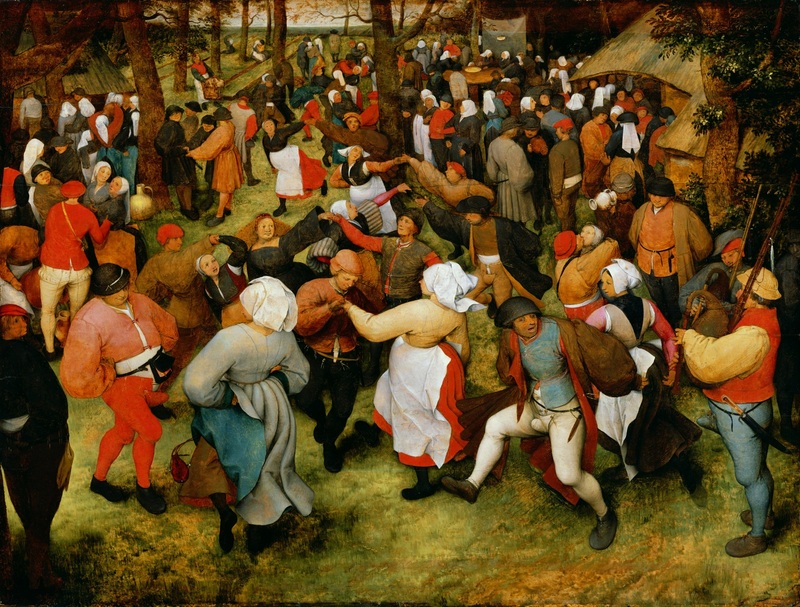 Consider “The Wedding Dance,” a 16th-century work by the Flemish painter Pieter Bruegel the Elder. Detroit museum visitors have enjoyed this painting since 1930. How much would it cost to preserve that privilege for future generations? A tidy sum, as it turns out. According to Christie’s, this canvas alone could fetch up to $200 million. Once interest rates return to normal levels — say, 6 percent — the forgone interest on that amount would be approximately $12 million a year. If we assume that the museum would be open 2,000 hours a year, and ignore the cost of gallery space and other indirect expenses, the cost of keeping the painting on display would be more than $6,000 an hour. Assuming that an average of five people would view it per hour, all year long, it would still cost more than $1,200 an hour to provide the experience for each visitor. In If It’s Worth Doing, It’s Worth Doing With Made Up Statistics, I endorse trying to think quantitatively – not because we are always very good at quantifying things, but because sometimes just the attempt to quantify things makes the right answer so drop-dead obvious that whatever errors you make won’t change things one way or the other. In the comments on MR people object that maybe some of the numbers in the calculation are a bit off, and that’s probably true. But just by trying the first numbers we think of, we realize we’re three orders of magnitude away from the spot where this would be a hard problem. And our numbers aren’t that off. And this is why I continue to identify as consequentialist even though consequentialism is very hard and we can never do it exactly right. You don’t need a complete theory of ballistics in order to avoid shooting yourself in the foot. Since I’m already being all soulless and analytical, let me just come out and say it – sell every piece of art in Detroit, but hire skilled forgers to make exact copies of them for a couple of hundred dollars each. You’ll have made billions of dollars, and the Detroit Art Museum will look exactly the same to anyone who’s not examining it through an electron microscope. Sure, it’ll make it a little harder to signal snooty cultural superiority. But if you’re living in Detroit and trying to signal snooty cultural superiority, man, I don’t know what to tell you. This entry was posted in Uncategorized and tagged economics, rationality. Bookmark the permalink. And our numbers aren’t that off. If you ignore that continuing to own the painting means that the painting will appreciate in value, your numbers are that off. If the painting appreciates at a rate equal to the interest rate, the cost of keeping the painting rather than selling it and using the proceeds to earn interest is nothing at all, not $1200 per person. Doesn’t that argument only work if you sell the painting at some point? And if you know you’re going to sell it at some point, wouldn’t the best point be when you’re in a horrible black hole of debt and desperately need money? I was about to post exactly this before reloading and seeing if someone had done it first. Zero (0) useful things like municipal infrastructure, government employees, etc. Edit: In other words: this “appreciating value” of the painting, can I use it to buy things? In other words: this “appreciating value” of the painting, can I use it to buy things? Of course it can. You sell it at the moment you wish to buy stuff, gain the market value of the painting in cash, and use the cash. You don’t sell it in advance in order to gain the interest from keeping the money rather than keeping the painting. If you sell the painting and get money which earns interest, you have $X more in money. If you keep the painting and it appreciates by the same amount, you have $X more in assets. Either way your ability to make purchases has increased by $X..
And if you know you’re going to sell it at some point, wouldn’t the best point be when you’re in a horrible black hole of debt and desperately need money? Yes, of course–but your initial claim implies that keeping the painting costs you $1200 per person compared to selling it and keeping the money to earn interest. It doesn’t. If the painting were going to appreciate faster than market rates, the best thing to do would be to take out a massive loan bigger than the black hole of debt, leverage it with the painting’s value, and expect to pay it off plus far more than interest when you sell the painting much later. The missing piece of analysis is how much the painting is worth to the market *compared* to its worth to the city of Detroit, and also the market’s expectations for the painting’s future value. It’s not inconceivable that somebody trying to signal cultural superiority lives elsewhere in the world, to whom the painting *would* be worth closer to $1200 an hour to view. And the market for per-hour-viewing of the painting has time-value expectations that are not likely to make the painting appreciate faster than interest rates. So still, sell the painting. The efficient market hypothesis applies to paintings just as it does to other goods. If it is known that the painting will be worth $300 million ten years from now, then the painting will sell for approximately whatever anything else known to be worth $300 million ten years from now will sell for (assuming costs of ownership and earning potential are equal between the two goods). Speculators do not leave money on the table. Unless you have information which the market does not possess, you should not expect to lose anything by selling something at market value (subject to list of obvious economic assumptions). And also the “Once interest rates return to normal levels — say, 6 percent” seems unmotivated; if we are deciding whether to sell the painting now, surely the relevant comparison is what the interest rates are now. Judging from my poor savings account, the current interest rates seem to be ~0%, so not selling the painting forgoes roughly $0 in interest. (And similarly, getting new loans to roll over the old ones, without selling any art, is unusually cheap). When people talk about the interest rate, they’re not talking about personal bank savings accounts, which are consistently a net loss of value after inflation. As an individual investor, if you have money you don’t need on a daily basis, you should be storing it in a low-overhead index fund, which actually does generate value for you at a long term expected 4%-or-better *after inflation*. Yes, even today — last year the fund I use, Vanguard’s VTSAX/VTSMX, returned 22.71%. “The interest rate”? Can you elaborate? There are lots of interest rates. The two relevant ones here are the rate at which the painting is expected to appreciate (if at all – there is not a particular reason to think paintings will appreciate above inflation), and Detroit’s cost of funding. Calculating the cost of funding of an entity going through bankruptcy is actually kind of hard, because the lack of funds on hand may actually cause your debts to decrease. It’s also tricky when that isn’t prepayable, unless you making a decision at a time when you’re rolling over a lot of debt. An easier question is, if Detroit does manage to hold onto the paintings through the bankruptcy, and ends up with a significant amount of debt at a nontrivial interest-rate, should it then immediately sell the paintings to pay off some of the debt. In that case, Scott’s analysis becomes pretty relevant. How close do you expect the two to be? If it’s off by 1%, then either the conclusion is off by a factor of six, which isn’t a huge deal, or it’s off by a factor of negative six, which is important, but do you really think that paintings appreciates faster than interest rate? If that were true, why wouldn’t more people invest in paintings? If Detroit has a fire sale with the DIA’s stuff, I guess rich people will be less likely to give expensive art (or money to buy it with) to the DIA. “The Wedding Dance” is a really cool painting, with a compelling weirdness. Seeing it in person is very different from seeing a picture of it. Another personal fave is this Van Gogh self-portrait. You can literally stand less than a foot away from this thing and see that it is globs of paint on a little canvas and your mind will be blown. I’m confused; why would my mind be blown by the fact that it’s globs of paint on a canvas? Isn’t that what I’d expect it to be? I think the idea is that it’s painted in such a way that from a distance the picture-ness of it stands out, but as you get closer, you stop seeing a picture and the paint-ness of it stands out, in a way that’s not really well represented by two-dimensional printed reproductions. But then again, I’ve never seen it in person because it’s in Detroit. For me at least, seeing it in a book and having someone tell me it’s globs of paint (which of course I too already knew) is a System 2 experience. Seeing it in person gave me “feels”. I’m still confused about why seeing that it’s globs of paint would blow your mind, regardless of whether you expected it to be so. Is this one of those unexplainable aesthetic responses? Said, you probably won’t see this since it’s three or four months late, but yes, it probably is one of those unexplainable aesthetic responses. In that case, we should consider actually hiring a forger, instead of just joking about it. The trick is, if you can avoid selling your art when you go bankrupt, you can tell your creditors to go to hell, there’s no money, and you still have your art. It’s free paintings! Museums are chock full of acknowledged Roman copies of Greek art and unacknowledged forgeries of artists only a few hundred years old. I feel like there is some Schelling point violation in selling art then getting forgeries. Other museum owners might try it out, and the practice of selling for a good price and getting forgeries will become unsustainable. And the reputation of the museums might go down the toilet. Also culture and art are not about esthetics, they are about a creating a common set of shared social experiences. Moreover art is intrinsically valuable – people create livelihoods out of it. The enjoyment of audiences is only a small part of the value of art. I found this to be an interesting argument in favor of funding the arts. Consider a world in which the city sold all of its masterpieces. The city would not just be lacking the enjoyment that audiences would have derived from the works, the city would also lack all of the future artists and people involved in the arts who were inspired by that work. And I am of the opinion that the main purpose of government is not to mess everything up, perhaps this will change in the future. I don’t think that extreme social experiments should be the norm for governments and selling all art is pretty extreme. If you’re gonna try extreme social experiments, try them in places that are already pretty messed up, like Detroit. Same reason they do extreme medical experiments to try to save the terminally ill. If the enjoyment of audiences is no big deal, then why does the art need to be hanging in a museum? What’s the problem with selling it? It’s not like the paintings will be burned after they’re sold, right? No, it almost certainly won’t be deliberately burned for teh lulz (but there probably are people who would). It *might* be sold to some other museum, but it is quite likely to be sold to a private buyer who will keep it in some bonded warehouse somewhere – it becomes entirely inaccessible to the public, and to the academic study. When counting the benefit-to-Detroit of having this painting in a museum I do not think it is entirely correct to think only of the time people spend standing in front of it. Some people will travel to Detroit entirely, or mainly, in order to visit it’s art museum (and this painting, in the museum) – Detroit is not exactly a thriving tourist destination, but if they do sell all the art and close the museum it will have even less of a tourist trade. Tourists don’t just buy museum tickets – they need lots of other stuff too. Er… how many people make a trip to Detroit mainly to see one particular painting in one of its museums? (Or even all the paintings in that museum?) Sounds like a pretty implausible scenario. I feel like you are sloppily going back and forth between different proposals. The first proposal is to sell off the most expensive works, those priced an order of magnitude or three more than the typical works. This is not at all extreme. What probability do you put on the hypothesis that the inspiration provided by these works is proportionate to their price? You seem to condemn a proposal that no one makes: completely eliminating the art museum. Yes, this is extreme, but it is a straw man. Scott’s proposal is to sell off the originals, but keep forgeries. This maintains at least some of the enjoyment and inspiration. This proposal is extreme, but mainly because of the global consequences of your first paragraph and not because it is likely to deprive Detroit in particular of future artists. If one could isolate the local effects, I think that this is an experiment well worth doing. In a fixed museum, I wonder how the price of paintings as set by the market compares to the value as set by the patrons, implicitly by how much time they spend. Does the painting with a 1000x price tag get 1000x as many eyeball-minutes? How important are fame and size and how important are details that the curators can control? What probability do you put on the hypothesis that the inspiration provided by these works is proportionate to their price? … Scott’s proposal is to sell off the originals, but keep forgeries. This maintains at least some of the enjoyment and inspiration. To follow this up: will audiences gets less enjoyment, and other artists get less inspiration, from suitably well-done forgeries than from originals? After all, a good forgery is indistinguishable from the original except by careful, meticulous inspection by professionals; certainly the overwhelming majority, if not in fact the totality, of museum-goers wouldn’t even be able to tell the difference. By the way, why do we have to hide the fact that we’ve sold the painting and are displaying a forgery? (Well, we might have to find a word other than “forgery” to describe it.) Surely the audiences will get as much enjoyment, and other artists as much inspiration, from the imitation (assuming it’s a high-quality imitation) as from the original? What’s the downside — reduced revenue from admission fees? Isn’t that already pitifully low? Replica is the word you are looking for. Personally it wouldn’t bother me, as a museum goer, but then again, I am not much of a museum goer. Ah yes, “replica”, thank you. That works. How much of the audience of the DIA comes from within the City of Detroit, and how much from the suburbs? How often does the average Detroit resident go to the DIA, compared to the average resident of Ann Arbor, or Hamtramck? How often will children who go through 12 years of school in Detroit go to the DIA, compared to children from the suburbs? And importantly, how much less inspiration (and enjoyment) would there be, both among city dwellers and suburbanites, if the DIA sold the most lucrative 10% of its collection, but kept the remaining 90%? I live in Detroit(*) because that makes it much easier to feel smugly cultured relative to my neighbours. With respect, the problem with consequentialism is that one has to be realistic about consequences, even if they’re uncomfortable. Fact of the matter is, there is no allowable way from here to a place where Detroit has good government. So if they don’t sell it, a few revolting hustlers and finance vultures get less money; but the downside is that the painting stays somewhere where few people enjoy such things. If they sell it, bad people get more money, but the painting (hopefully) ends up somewhere where more people who want to see it, can see it. Either way, Detroit is what it is. I think it would be rather hard to quantify any of the above except the amount of money frittered away to corrupt interests. Well, this objection only strengthens your argument, but do you really think Detroits financial problems are temporary (on the scale of city governance, not cosmically, of course)? Care to set an over/under date on two consecutive years of budget surplus? Wait, maybe you mean the solution would be temporary, not the problem. That is true. If you spent an hour driving to the museum and an hour walking around the museum and an hour driving back home, and one of the primary purposes of the trip was to see the Wedding Dance, then the value of looking at the painting for one second isn’t $120, it’s more like the full $1200 or maybe even more in made-up-statistics. You could even argue that I have arranged my entire day around this trip to the museum, that every painting-looking-second should be discounted across the whole day. I don’t think this changes your calculations, though. Now I want there to be a “double-blind exhibit”, where each visitor is randomly assigned to a room with either a real artwork or a forgery. Then they’re asked to rate their enjoyment of the piece and their % confidence of it being the forgery. The data could be helpful to break the art market’s fascination with originals (or our own assumption that forgeries are any good), and it would attract a lot of media attention and visitors to boot. This is naive. The average person values seeing the real thing just because it is real. That’s why tickets for the stones sell for more than tickets for umpteen tribute bands. The truth of your general claim aside… is that really a good analogy?? Don’t the performances differ? Doesn’t the sound differ? I mean, the point with the paintings is that you wouldn’t even know it was a replica/forgery unless you were told. Surely you’re not claiming that it’s impossible to tell whether you are, in fact, viewing the Rolling Stones in concert, or whether the people on the stage in front of you are some other band entirely? I’m pretty sure it’d cost a lot more than a couple hundred dollars to hire a forger good enough for museum display. Lot less than two hundred million, though. Pei-Shen Qian, caught last year but indicted yesterday, made an average of $1000 for 80 paintings in the styles of specific abstract expressionists, good enough forgeries to reach final market prices of a million each (after passing through 3 dealers, each making a 10x markup). That number may include a premium for criminal activity, but more likely it is the result of a bilateral monopoly negotiation, the gains going to the dealer who was, of course, better at negotiation. Replicas of a specific work good enough to fool specialists in that particular artist are probably more expensive, but maybe not. Replicas of a specific work good enough to fool non-specialists are probably cheaper. It could be that it’s just easier to forge a painting well than to sell a painting well. You have to have a lot of capital to be an art dealer, and there’s a lot of risk in accidentally paying too much for a painting. If we assume that museums with expensive, famous paintings are something like a show of strength, and that human habits are not necessarily wrong, then we should look at what happens when museums sell major artworks. Also, from what I’ve heard, museums tend to accumulate a lot more art than they have room to display. How much could Detroit get if the museum cleared out its storerooms? Could you expand on what you mean by this? So, owning expensive art is proving that you have more money than you need. Hanging on to it means that you can maintain stable ownership. The bit about human habits not necessarily being wrong is that Guardian ethics don’t make a lot of sense from a (naive?) utilitarian or consequentialist viewpoint, but they’re a basic human pattern, and might have their uses. Is this a descriptive or a normative account of ethics…? It’s descriptive, with some implication that there are two incompatible systems which are appropriate for different purposes. I’m an art student and I’ve never understood why visual art is held in such high regard in our society. I understand why the arts as a whole – music, theater, movies, novels, painting, poetry, etc. are held in high regard, and I think they should be, but visual art of the type you see in museums, e.g. painting, sculpture, seems to be delegated an exceptionally high status and I don’t understand why. I think a lot of people who don’t “get” art have the problem that they are expecting too much from the art, like some hidden meaning of cosmic importance. Usually what’s there is what’s there, and either you like it or you don’t. But it’s no wonder that people have unrealistic expectations when society puts visual art on a mile-high pedestal for no obvious reason. Also as an aside I really like the painting in question. Pieter Bruegel is definitely one of the dopest artists in my opinion. Maybe visual art is most liked because it is easiest to consume quickly of all media. So people can look at more visual art in the same amount of time, and more easily find good examples to show other people. Also, lazy people who aren’t that interested in art might find themselves accidentally looking at visual art anyway, and the field becomes more popular. And once the field is popular, there is the feedback loop that people who enjoy visual art promote the field to others. Maybe I’m being silly, but is there a signalling problem with selling off something regarded as the cultural crown jewels of a city? Does it signal to property developers, potential rich immigrants and the like that you’ve given up, and they’d be better off being elsewhere? Of course, you can try to offset that cost by investing in a bunch of things that make the city an awesome place to be, and an attractive place for investors… But that might get expensive.